I'm posting few trail work entries this month -- trail work is good for the soul, it's good for the hiker, it's good for everyone. 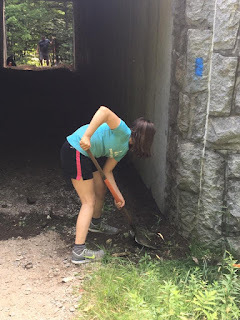 If you live anywhere near a trail, volunteer with the local crew from time to time. You'll be glad you did. Alex, Sage, and I were fortunate to work with Trailwrights again this month. Our schedules don't usually coincide with their trailwork weekends, so we were happy we were able to join them. We always learn so much from them! 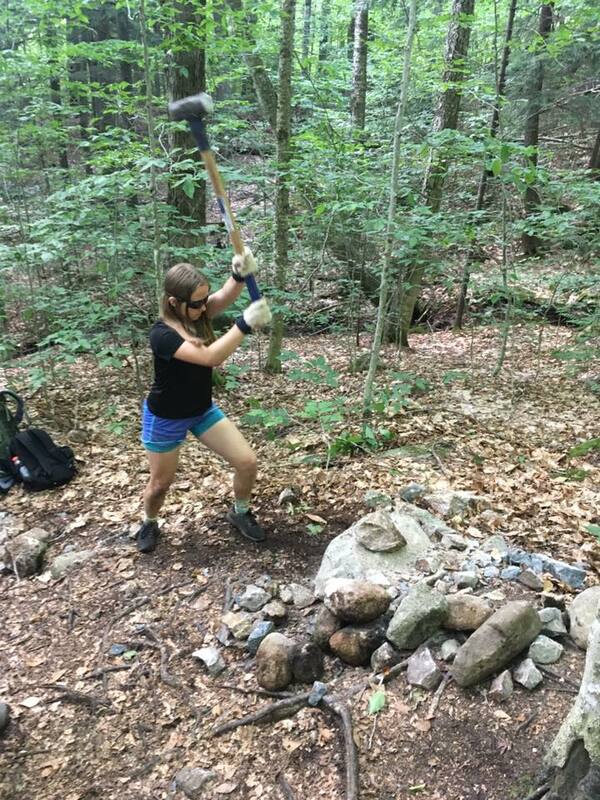 If you would like to learn some great trail building/maintaining skills, donate a weekend to them sometime! Their website is here. The girls and I are the official adopters of the Alpine Garden Trail (we are now certified in Alpine Trail Maintenance). Sage and I got in a few hours of brushing (trimming overgrown vegetation) last June, and Alex and I were able to put in a couple days work this month. Since we are trail adopters, and since we were doing at least two days of trail work in a row, Alex and I decided to stay at Camp Dodge. Lodging there is free if you are working on your trail. I checked in with Becky the morning of the 25th and then, following Becky's directions, headed to the under-17 girls' bunk room with Alex. Both of stayed in that room for the evening; the teen group that was working that week was out until Friday, so Alex and I had the place to ourselves (if I had not been with Alex then I would have been in the adult bunk room). After we had settled in, I drove up the Auto Road to the "Cow Pasture," the parking area before the summit. The views were less than stellar, which was fine with me since we needed to see how visible the cairns were on our trail in the fog. Unfortunately, the fog lifted as we headed down to the Alpine Garden Trail. We may put in scree walls here...will discuss with our regional supervisor and ask for his thoughts. It took a while for us to walk the mile+ trail to the intersection with Tuckerman Ravine Trail. Along the way, we righted fallen rocks on existing stone walls and brushed back krummholz that threatened to trip up hikers or poke them in the eyes. On the way back, we noticed a cairn would be useful on a rock slide that crosses the trail. In heavy fog, a hiker might veer too far up or down the slide and never see the cairn across the way. We therefore built a cairn right by where the trail is supposed to go so, even in fog, a hiker should hopefully be able to find his/her way. Alex tested the strength and sturdiness of the cairn when we were finished. It held up well. 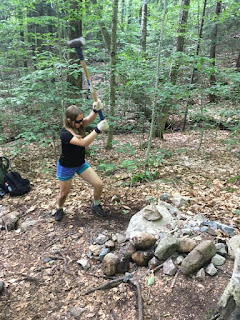 July 26, 2017 -- Seven hours -- minor scree wall reinforcements and rebuilding four cairns from the base up. Today was all about rebuilding as many cairns as we could physically handle in one day. We drove up and, right before we headed to our trail, our friend Samantha pulled in next to us. She was training a member of the OBS Museum that morning and had stopped to say hello. It was good to see her again. We were worn out by now...moving all those rocks is tiring. 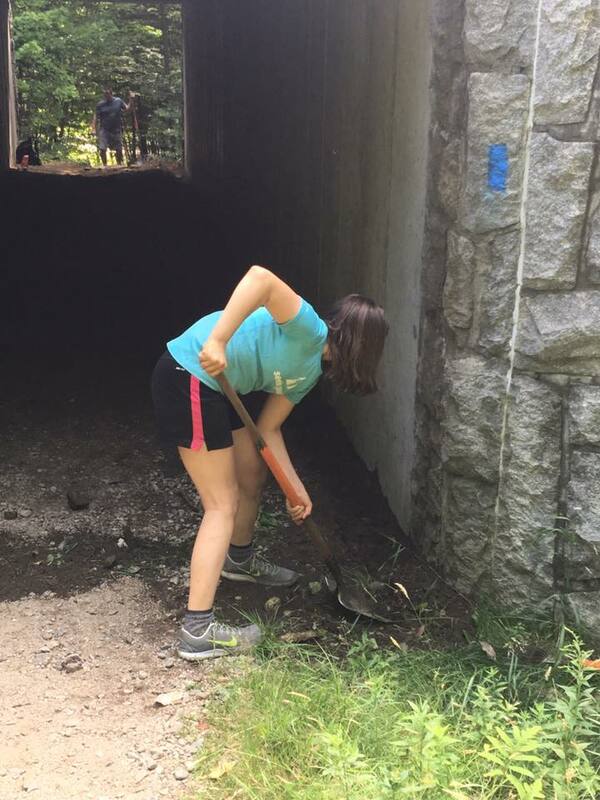 We had also reinforced existing scree walls as we came across ones that needed touch-ups. We called it a day after seven hours of work and headed home. I love the before and after photos.